In a large frying pan, cook the bacon until golden brown and just crisp, about 5 minutes. Remove with a slotted spoon and drain on paper towels. Pour off all but 1 teaspoon of the fat. Add the tomatoes, salt, and pepper to the pan. Cook over moderate heat, stirring, until the tomatoes soften slightly, about 3 minutes. Add the watercress and cook, stirring, until just wilted, about 1 minute. In a large pot of boiling, salted water, cook the rotelle until just done, about 12 minutes. Reserve 3/4 cup of the pasta water. Drain the pasta and toss with the bacon, 1/2 cup of the reserved pasta water, the tomato mixture, the butter, and the olive oil. If the pasta seems dry, add more of the reserved pasta water. Top with the sliced scallions. 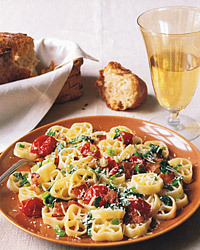 Serve with grated Parmesan. A straightforward white wine will be best. Either a Pinot Blanc from Alsace in France or a California Chenin Blanc will have enough body to stand up to the acidity of the tomatoes and the saltiness of the bacon in this dish.